Populizr is a Social SEO Automation Platform that can help you boost your social SEO and indirectly increase your website ranking on Google. Buffer is a platform for publishing content. It lets you schedule and publish the content on social media profiles. Populizr and Buffer support almost the same social media networks, but there are minor differences in their support options for posting. Does it look to you that they support a small amount of integrated social media networks? Believe it or not, it is enough. Most of the audience you want to target, can be found on these social media networks. Populizr offers two options for posting your content. The first option is to post your content right away and the second is to schedule the content for posting. 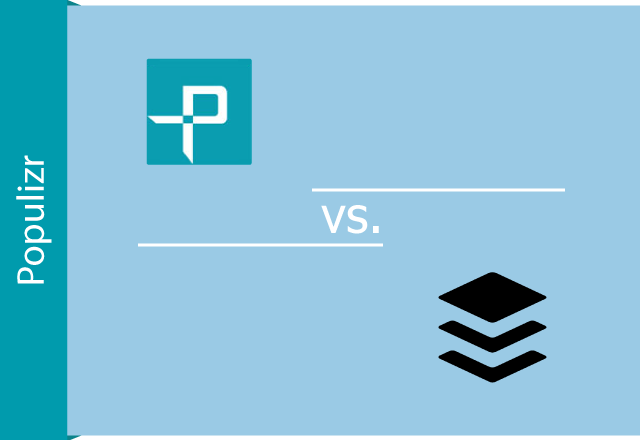 Buffer offers the same two choices for content posting on social media. Both social media automation platforms provide support for posting your content on many channels at once. As you can see, we found similarities between these applications which is okay. In our professional opinion, scheduling your content for posting on your social media channels is a much better option than posting your content right away. 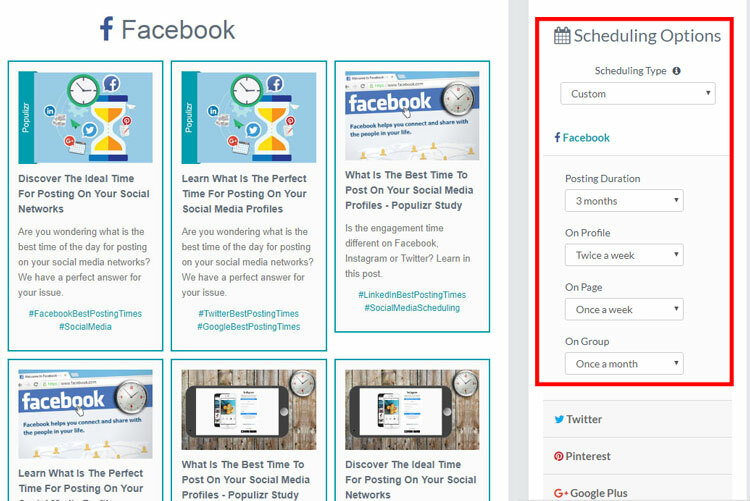 Both tools, Populizr and Buffer, offer several options for scheduling the content for posting. They both have default plans for scheduling or, if those plans don’t meet your requirements, you can create a custom scheduling plan. Populizr and Buffer provide the same RSS suggestion feature. It means you can take the latest posts from your feeds and schedule those posts to be ready for posting on your social media profiles. Social automation is a key factor in planning a successful social media strategy. It’s very efficient in taking care of your social media accounts, and it saves you a lot of time. Populizr offers complete automation of your posts, regardless whether it’s a single post or taken from an RSS feed. 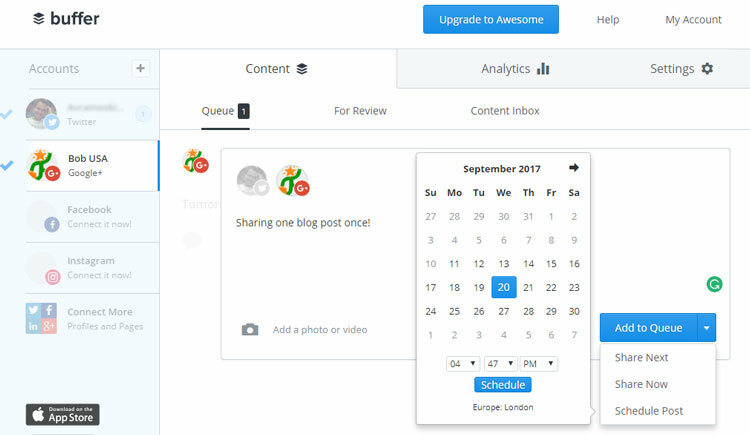 You can take your blog post and make complete marketing automation by scheduling it for posting on your social media networks even for a few months in advance (up to 1 year). Populizr allows you to create your social media marketing automation on complete auto-pilot, by posting multiple social media updates from a single blog post, randomly at the ideal time of your target audience. 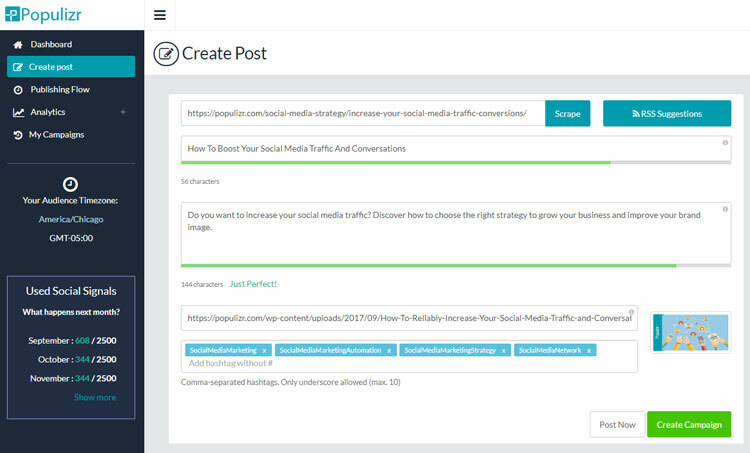 For example, you can choose one of your blog posts, put it in Populizr and create up to 25 different social post variations from that blog post. The variations will be automatically scheduled for posting at random time during the 3 months period when your target audience is most active on social media. Sounds cool, right? Buffer has similar functionality. However, regarding social marketing automation, Buffer has a little limitation. It doesn’t allow you to automate your blog post for scheduling multiple times randomly a few months in advance. Each post needs to be manually configured with the exact time for posting in the future. Also, Buffer has the flexibility of connecting with other automation tools such as IFTTT. Nevertheless, you can separately use the automation tools. With Populizr you can keep track of the analytics by a blog post or by demographics. By a blog post, you have a graphical and tabular representation of the analytics on the social media networks. The tabular representation of the analytics consists of the number of posts and clicks on your integrated social media networks. Demographic analytics represents a map where you can see the engagement for your posts from each country based on the social media channel (network). 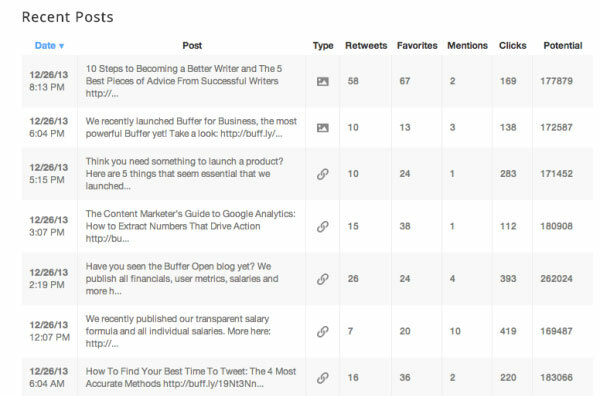 With Buffer, you can keep track of the analytics of the posts with a detailed tabular representation. In it, you can find the number of clicks, likes, and many other metrics you’d want to see. Buffer, on the other hand, lacks the option of showing the demographic representation of the analytics. The demographic analytics is one of the biggest differences between these social media tools. Both Populizr and Buffer offer proper security measures. The difference here is that Buffer provides email and social authentication and Populizr only provides email authentication. 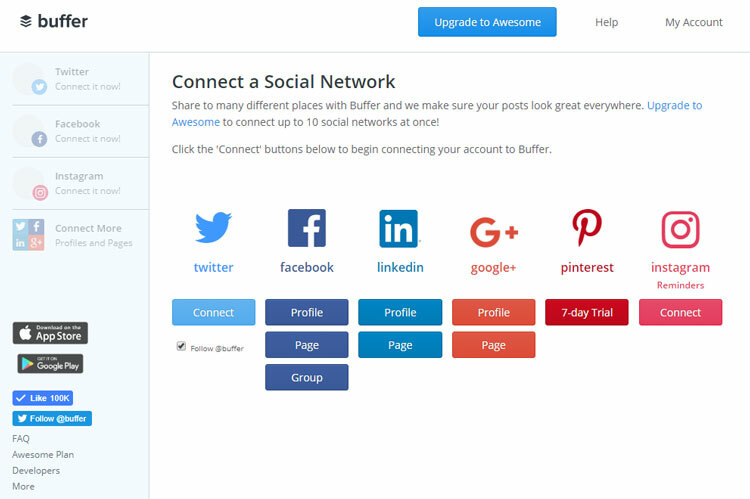 Buffer, among the social media networks, supports Facebook, Twitter, and LinkedIn authentication. Buffer and Populizr have two types of permissions. Buffer has a manager and contributor, and Populizr agent and moderator. The manager and the agent have higher access permissions, unlike the contributor and moderator – they are more limited. Buffer supports two layers of security to tighten it up. The first layer is authentication by email or social media login. The second layer is authentication with a received code via text message. Populizr supports only one layer of security, and that is email authentication. But, it doesn’t mean that Populizr is less secure to use. Populizr has the latest SSL encryption along with physical, administrative, and electronic systems designed to protect your information from illegal access. Both tools, Populizr and Buffer, have plugins that make their functionalities a lot easier. The difference here is that Buffer supports the use of browser extensions. With these extensions, you can directly post on social media. 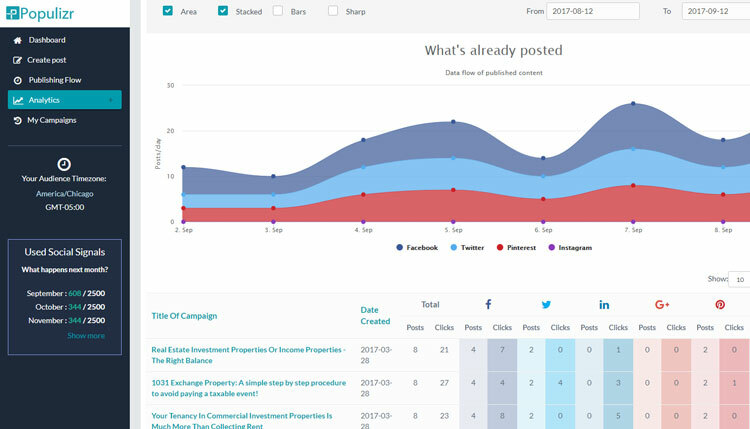 With the Populizr plugin, you can pull key data and create a social posting campaign in less than a minute. Time To Choose The Winner Between Populizr vs. Buffer! 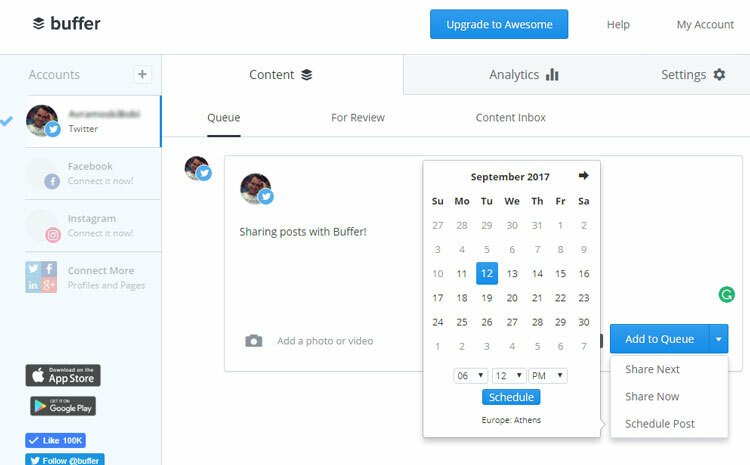 Even though both Buffer and Populizr are tools for managing content on social media platforms, their functionality is different. So, what do you think who should win this battle between the two? The truth is Buffer does offer more supporting tools, but that doesn’t necessarily mean it is better then Populizr. And yes, Populizr is a simpler tool, but with great advantage with its social marketing automation feature. The detailed analytics and precise audience targeting features Populizr has are just a bonus. So if you go for simplicity and complete social media marketing automation (for up to 1 year), the winner is definitely Populizr. If you go for complexity and a lot of manual work, then Buffer is your winning choice.